Aircast Cryo/Cuff For Large Foot with Cooler (Non Motorized Kit),Suffering from Swollen foot, pain and hemarthrosis; time to use Foot Cryo/Cuff with cooler. Suffering from Swollen foot, pain and hemarthrosis; time to use Foot Cryo/Cuff with cooler. Its unique design covers the entire foot to give it complete support and faster healing. Cryo/Cuffs are available with or without cooler. However, if used with the cooler, medical supervision is advised. 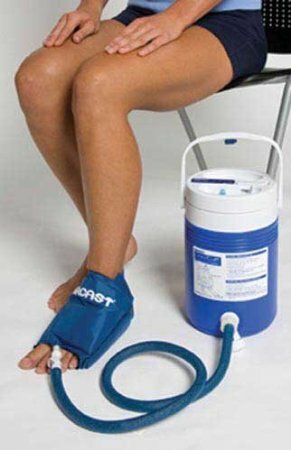 Aircast Foot Cryo/Cuff with cooler by DJO Canada is used to provide cold therapy to the foot to relieve the pain. Foot Cryo/Cuff provides complete coverage to the foot. Compression is measured for that extra comfort and support. Controlled cold eliminates any risk of tissue. For getting the correct size, Measure forefoot circumference. My husband had a foot injury and was asked to place ice packs 4 times a day which is becoming hectic. Then decided to get this product and this really worked. The cooler helped a lot and it gave instant relief.